See site for latest offers. Reckon you’ve got what it takes to wow the judges and win the nation’s heart with your Slingo expertise? Then, it’s time to discover BGT Slingo ( Britains Got Talent Slingo )! It’s a game that’s based on the popular TV talent show – Britain’s Got Talent – but rather than offering you a hallowed place on the stage of the Royal Variety Performance, it lets you play for incredible cash prizes of up to £20,000. Assuming that you’ve played other types of Slingo before, you’ll know that it’s a hybrid of bingo and slots. Just as bingo uses numbered game cards and balls and requires you to create lines in order to win prizes, and slots require you to spin the reels to determine the symbols that appear on the screen, Slingo Britain’s Got Talent uses a card/grid of twenty-five numbers laid out as five rows of five. Each game gives you eleven spins, and the aim is to create as many lines (known as Slingos) as possible. Like slots, you can also win free spins and boost your chances of winning with wild symbols. 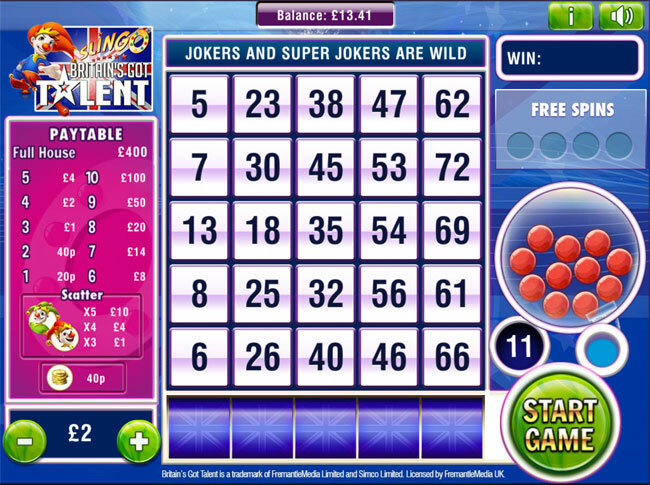 On the left side of the Slingo Britain’s Got Talent game screen, there’s a paytable which lists the various prizes on offer, and their values are linked to the size of your bet. Underneath the paytable are plus and minus signs which allow you to set your stake between 50p and £100. The biggest prize you can win while playing with the minimum bet of 50p is £100 and the most you can win while playing with the maximum bet of £100 is £20,000. To the right of the numbered grid, there are two boxes, one of which displays your current win amount, and the other which shows how many free spins you’ve collected (if any). Then, there’s the ball machine which shoots out random balls with numbers or symbols when you tap the Spin button. 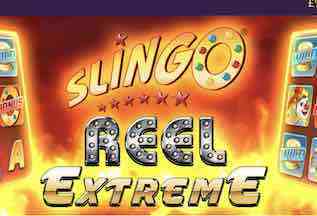 Each spin that you take on Slingo Britain’s Got Talent causes five numbers to appear on the reel underneath the grid, and any matching numbers are marked off accordingly. However, as well as numbered balls, the reels can also contain five different special symbols. The Free Spin symbol gives you an extra free spin at the end of the game. The coin symbol credits you with an instant cash prize. The two wild symbols – the Joker and the Super Joker – can be used to mark off any number on your card, although the Joker can only do this in the column it appears on while the Super Joker can remove any number on the entire grid. A combination of three or more Joker/Super Joker symbols gives you a cash reward, but the Devil symbol isn’t as kind as he can prevent you from making matches on the reels. When you have no spins left, Slingo Britain’s Got Talent gives you the option to purchase up to four extra spins for further chances of scoring wins.